Scooby was sculpted without fur to be molded and finished with glass eyes and fur transfer. Was this made for the live-action movie made in 2002? Or did you had no experience with it? The details you put into your work renders me speechless. that I cannot see this masterpiece in person. This is a wonderful sculpt and design. You sir deserve a Scooby snack! Wow! This is so grand! You captured his character in the most realistic way possible! It is almost like looking at the real deal. If only it were finished... Do you have any pictures of the finished piece? I would very much love to see what it ended up looking! I love the way you captured his scared expression!! cool. are you going to paint him/color him? I cant tell you how much I adore this! Oh and what do you use to sculpt? Looks like him. Probably would have given him less saggy cheeks, but besides that it's fantastic! 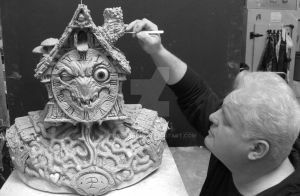 dude, star sculpting in 3d!!! Reminds me of the old episode with the 'coin, coin' mummy when Scooby supposedly gets turned into a statue. Great work. THIS IS AWESOMLY REALISTIC! I LOVE IT! This is just gorgeous! I would buy this. wow thats amazing, have you got a picture of the final version? this is absolutely amazing! ive always admired great danes and you have done a superb job on this sir! Oh my goodness gacious. That is cool. That is cool as hell. I want one. The details are so right on, and so so, for lack of a word that actually describes this, Pure freakin awesome in so many ways. Someday I want a real dog like Scooby! Love pose and the expression! Absolutely gorgeous. Love the expression on his face. He is so wrinkly and wonderful! I think this deserves more than what the people on deviantArt give you credit for. wonderful work you've done! i absolutely love it. Genius. I absolutely adore it. Now THIS is how Scooby Doo should've looked in the movies, this piece is awsome!!!! I absolutely love this! One of my favorite characters and I never thought I'd see him in a life like sculpture. Your work is amazing. This made my jaw drop... literally. Amazing!